Is your profile picture your cat? It’s very cute. tis my troublesome baby under the newspaper! Hey Dizz, I remember that you used to roleplay with us a fair amount. The RP section is kinda going through a new phase. Three of the old guard (myself included) are leaving, and the section is without direction and looking for new active players. I know you enjoy it, so I just wanted to extend the offer. I think you might enjoy the high school RP. From what I remember of your style, you could fit pretty well there. And if you have an idea for another RP, you can either start it yourself or bring it up elsewhere and have someone else run it. There's always a way to make room for someone's preferences. Dizzi, I just figured out my problem with the Ocean Necropolis and I feel silly. Turns out I just didn't know I could walk across the dragon head's nose! 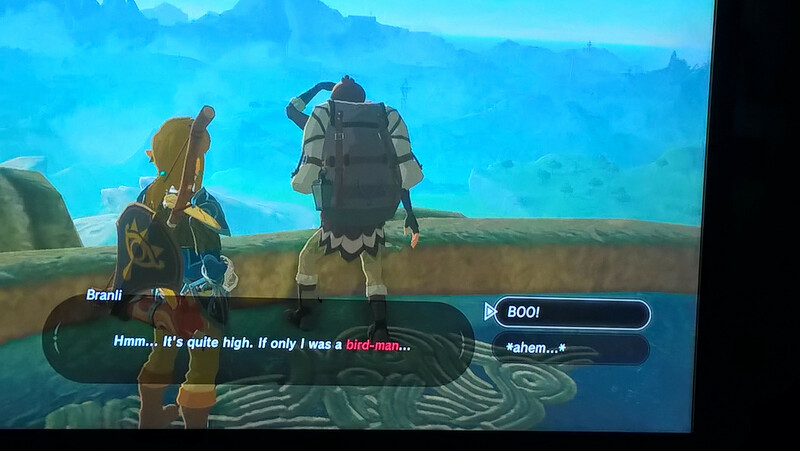 I was playing Breath of The Wild and immediately thought of you when I saw this. Congratulations on the third-place win at the Halloween contest. You're welcome! You did a great job with your entry, by the way. Even if you hadn't asked me to vote for you, I think I still would have. I didn't, actually it was Rass who re-did my pic!! Really? Then the next time I see him, I'll have to tell him what a good job he did.